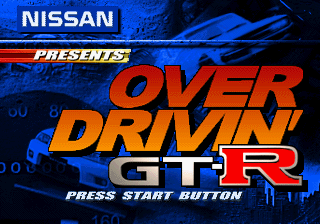 Nissan Presents Over Drivin' GT-R (オーバードライビンＧＴ－Ｒ) is a 1996 racing game for the Sega Saturn. Over Drivin' GT-R is a heavily localised version of Road & Track Presents The Need for Speed, with all the cars replaced by vehicles produced by Nissan Motor Company (plus a few with Datsun branding). Japanese Saturn owners never received The Need for Speed itself, though PlayStation owners did in the form of Over Drivin' DX (to distinguish from the original 3DO version). Though much of the core engine remains the same as The Need for Speed, many of the tracks in Over Drivin' GT-R are unlocked from the start, there are minor sound changes and FMV and graphics replacements. Whereas the original version features a number of similar cars that can compete with each other, this version of the game is simply meant to illustrate a history of varying Nissan vehicles. Gameplay is also slower than The Need for Speed. The "Premium Pack" version of the game came with a free keyring. Main article: Nissan Presents Over Drivin' GT-R/Magazine articles.